One product. Two dilutions. 95% of general cleaning. 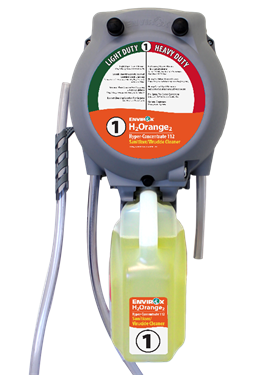 Our premium, patented original formula combines cold-pressed Orange Oil and hydrogen peroxide to clean, deodorize, degrease and sanitize any water-safe surface. Our new hyper-concentrated formula delivers even more value per gallon! Fragrance: Fresh Orange. Uses: Glass cleaner, stainless steel polish and cleaner, neutral floor cleaner, restroom cleaner, carpet spotter, carpet cleaner, food degreaser, deodorizer, tile & grout renovator and more! Our unique hydrogen peroxide technology in a multi-purpose, neutral pH cleaner with cold-pressed Orange Oil. Excellent deodorizer, glass cleaner, tile renovator and more! Our unique hydrogen peroxide technology in a multi-purpose, neutral pH cleaner with a clean, light scent. Excellent deodorizer, glass cleaner, tile renovator and more! Fragrance: Clean Linen. Uses: Glass cleaner, stainless steel polish and cleaner, neutral floor cleaner, restroom cleaner, carpet spotter, carpet cleaner, food degreaser, deodorizer, tile & grout renovator and more! Low-cost, streak-free neutral floor cleaning with no sticky residue. Fragrance: Clean Linen. Uses: Tile, Linoleum, Marble, Rubber, Slate, Terrazzo, Tavertine TIle, Wood, VCT Flooring, Athletic Flooring and more! 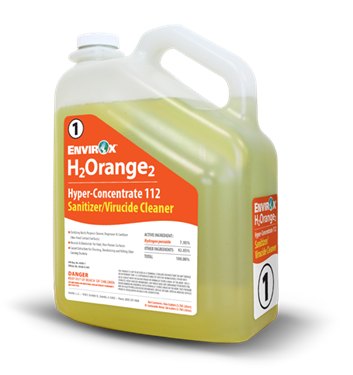 A reduced toxicity alternative to strong acid-based cleaners. 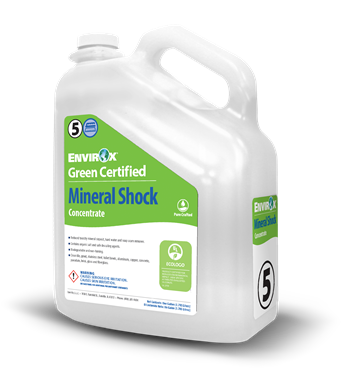 A highly effective mineral deposit, hard water, and soap scum remover without the harsh fumes and high toxicity. Contains a unique, reduced toxicity, acid-replacement technology consisting of a low pH organic salt and safe degreasing agents. Fragrance: Neutral. Uses: Sinks, showers, tubs; Toilets, urinals; Tile; Grout; Stainless steel; Aluminum, copper, brass; Concrete, brick; Terrazzo; Porcelain; Glass, fiberglass. Powerful tile & grout renovation with no acids, phosphates or harsh fumes. Make your grout white again with the power of hydrogen peroxide and cold-pressed Orange Oil! 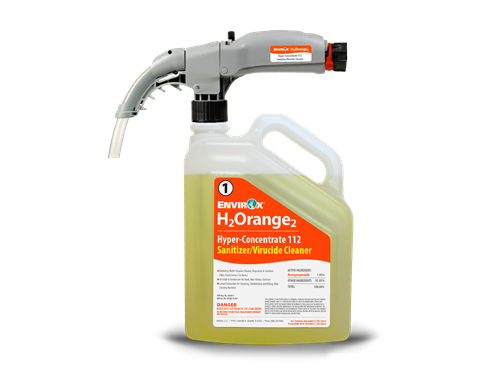 This unique combination penetrates grout lines, allowing the hydrogen peroxide to penetrate surfaces, oxidize, and eliminate the source of odor. Use for heavy-duty cleaning and renovation of tile & grout. Fragrance: Fresh Orange. Uses: Tile, stone, terrazzo, travertine tile, linoleum, VCT flooring, marble, rubber, slate, wood, athletic flooring and more! Heavy duty degreasing without the safety and environmental hazards. Attacks grease, not you! Our Industrial Degreaser works better than traditional solvents, with no butyls, trichloroethane or other harsh ingredients. Fragrance: Neutral. Uses: Food grease, car or bus exteriors, hard floors, carpets, cement sidewalks, manufacturing equipment, desks or whiteboards. EnvirOx’s Non-Acid Disinfectant is designed as part of a 2 product system. Do 95% of your cleaning with one of our proprietary multi-purpose cleaners. Then, complete your system with Non- Acid Disinfectant only when broad spectrum disinfection is needed. No added fragrance. Uses: Disinfection of touch points and critical areas. Dispense a variety of products through one small dispenser. Maximize your cleaning options with one compact design. Switching between multiple products is as easy as Dock, Dial, Dilute™. There's no need to buy a new dispenser for one-off cleaning challenges. One product, two dilutions, 95% of cleaning. 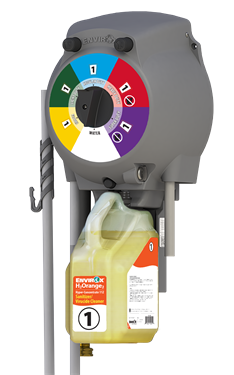 Simplify your system with a Single product dedicated dispenser. Dispense with the push of a button. Space-saving compact design. Portable cleaning for small spaces and mobile teams. Compact dispenser offers two versatile dilutions. Just attach the dispenser, select your dilution and squeeze the handle to dilute. Includes foaming or spray attachments for big jobs. *This product meets Green Seal® Standard GS-37 based on effective performance, concentrated volume, minimized/recycled packaging and protective limits on: VOCs and human & environmental toxicity. GreenSeal.org. Absolute™ Cleaning System bottles are patented under U.S Patents 10,081,455 B2​, D821,879 S, D822,492 S, D821,881 S, D785,457 S, D785,456 S and D788,587 S.
For immediate help, call our customer support line at 1-800-281-9604, Mon-Fri 7am to 5pm CST.